Well, there a two ways of analysing this …firstly, the ancestor of an action is a thought , which is a sculptor who creates who we want to be.. One might wonder that he is just thinking bad ,but is not bad enough to act it out.. Well, when you can think , u can as well do!! Another way of understanding it is as follows.. When we think of grief , we pray silently to god .. That prayer too is nothing but a stronger version of a thought directed towards god.. But after all it’s also a thought! Then it can be said that praying becomes an act .. Hence to think is to act mentally… So to think bad is indeed equivalent to act bad ! Yesterday morning , sadguru blessed us with a speech about how we must acquire more punya and reduce the burden of paapa by thinking and acting righteously.. This fact was reinforced by pujya balaswamiji too while explaining the Ramayana .. Pray to Sadguru to bless us all with a series of pristine pure thoughts just as sadguru’s vastram and the lake depicted in the video… Jgd puttuji.. It is important to keep the mind clean and Sadguru Deva has provided us the tip as how we can achieve it. By remembering God and His glory, chanting mantras and through the darshan today in the video, Sadguru Deva is also pointing towards Kriya yoga, as the way of getting rid of this evil. JGD.The society is destroyed by the wicked thoughts and actions.Avathara are comming again and again in Kaliyuga to evert this disastor.Sri Ganapathy sachchidananda swamiji is striving to achive this.He won the war on Evil with Ramayana. If the law of causality is the foundation of the universe it also works on the mental plane. So it is beneficial for others as well as for us to have always good thoughts, especially in situations where we feel challenged. Thank you Appaji for reminding me! jaya guru datta, we follow your instructions appaji. please guide us. Very nicely explained Puttuji! Thank you so much!!! JGD Puttuji!! this is a wonderful video and i have just realized i should try my best to overcome this.Also, i have experienced several times whenever i had very good positive thoughts about something that has come true!! We pray Appaji to bless us with positive thoughts!! Jaya Guru Datta Puttuji ! Thanks for the sacred teachings and blessings, the fact about Thought and Action. In the physic presents of Swamij my mind is getting more calm. I experienced moments of very clear thoughts about myself and realized how my silly mind is usually working. I wish to practice more and more carefully observing my mind and control the thought patterns showing up. I pray for courage to face it. Jaya Guru Datta Puttuji! Harih Om Tatsat ! Thanks for the sacred teachings and divine blessings of Pujya Sadgurudeva through Nandana SGS MMS 54-Nada Yoga video.Through this video Pujya Sadgurudeva teaches us that Bad and Negative thoughts will keep us away from Satkarma and Positivity,inturn, we will be losing the Grace of Sadguru/God,as our reciever is not fit to be eligible to recieve the Sadguru vibrations.As per my experience the Satsanga,Guru Dhyana and Guru seva will keep us away from Bad and Negativity. I pray Pujya Gurudeva to bless and give us the strength to be in Satsanga,Guru Dhyana and Guru seva to attain Noble thoughts and Positivity. You are helping us in so many different ways to control our thoughts. By Kriya Yoga, chanting Mantras and Bhajans, we try to stay focused in You. Still or just because there are so many bad old emotions and thoughts coming up. I try to understand them and to let them go with Your help. Thank You so much, dear Sri Swamiji, to free me more and more! Jaya Guru Hanuman, Beautiful message Swamiji. In one of the earlier messages we are told to – “Cultivate noble thoughts in the mind. Express them in pleasant words. Reflect them in your actions. The way to heaven is this”. In this Sri Swamiji explicity mentions that bad thoughts are as harmful as bad actions. We now understand that the source of all our actions are thoughts. If our thoughts are good, we will do good actions. If the thoughts are bad, we wil perform bad actions. This message reminds me one of Dattatreya’s 24 gurus – Sea. Even though the sea is very large, it does not even allow a small dry leaf landing on its surface to stay there. Instead, the sea drives it away to the shore. If the sea had not always done so, it would have been covered up with moss like a tank by now. Similarly we should drive away all the bad thoughts from our minds with the teaching of our Guru. Let us all pray for strength, intellect and knowledge. Jaya Guru Datta. What a big lesson. Even when we feel hurt or discomforted by someone to control the mind and maintain good thoughts. i think that Satsang and Meditation can help. Maintaining good thoughts and controling of senses can be a result of a strong relationship with God that lasts/survives even in difficult situations. Please God, help to maintain such strong relationship with you. Sri Guru Datta, Om Namo Hanumate Namaha. Jai Guru Datta, appaji plz shower ur blessings on me so that i can eliminate all bad thoughts and anger. Sri Guru Datta. Wie klar ist diese Botschaft, wie rein ist die Musik- und Bildpräsentation! Und ach, wie schwierig ist es für mich, meinen Mind zu kontrollieren! Das ist mir eine grosse tägliche Hilfe. Danke! Jai Guru Datta, I know how powerfull and important are thoughts, please Appaji help me to have only good thoughts, prostrations to my beloved Sadguru. “Sri Poojya Swamiji” initiating us now, with the word “thought”. The fragrance emanating from a small flower spreads over a long range. But the diffusive power of man’s thought extends over eighty thousand crores of miles. The speed of man’s intellect which realizes such diffusive power is 20, 000 miles per second. The diffusion of his thought is spread everywhere, that which pervades every place and at all times is thought. Sound any solitude, Primordial any destruction. Darkness any comparison, the Wise any equal? And sound is but thought. This fire is but thought. Atoms formed is but thought. Thought is the greatest force and an electrical impulse, on earth and in other planes also. Thought radiates everywhere just as does the program from a radio station. That is, they can ‘tune in’ to the thoughts of another person, and can also inject one’s own thoughts into the receptive areas of another person. An evil thought is thrice cursed. First, it harms the thinker by doing injury to his own mental body. Secondly, it harms the person who is its object. And lastly, it harms all mankind by spoiling the whole mental atmosphere. Light travels at the rate of 1, 86,000 miles per second, and thoughts virtually travel in no time. Those who harbour bad thoughts are very dangerous persons. They cause unrest and ill-will amongst all the human beings. Their thoughts and feelings are like wireless messages broadcast in ether, and are received by those whose minds respond to such vibrations. Every thought has an image. Each thought is a link in an endless chain of causes and effects. The best medicine for keeping good health is the entertaining of divine thoughts. The waves released by divine thoughts, by Kirtan, Japa and regular meditation, will electrify, rejuvenate, energies the cells, tissues, and nerves. That is why “Sri Poojya Swamiji” asks us to do Bhajans, Namakeertnas, always. Mental actions are real actions. Thought is the real action whatever we send out of our mind, comes back to us. Every thought we think, is a boomerang. It is our thoughts that cause the round of births. So, we should always strive to purify our thoughts. The mind contains the impressions of thoughts and actions of the previous births. Useless thoughts stop our spiritual growth; the goal of life is the attainment of divine consciousness. This goal is the Self-realization that we are neither this perishable body nor that changing and finite mind, but we are all-pure, ever free Atma. Thought is a bridge that connects the human with the Divine. The last thought determines the next birth. Our destiny is mapped out by our thoughts. We have to destroy ruthlessly all bad thoughts. These evil thoughts induce weakness, disease, disharmony, depression and despair. And Cultivate positive thoughts such as mercy, courage, love and purity. The negative thoughts will die by themselves. We have to try this and feel our strength. Pure thoughts will infuse in us a new exalted life. The mind’s acts, and not the bodily acts, are alone true acts. It is the actions of the mind that are truly termed Karmas. Thoughts and acts are interdependent. There is no such thing as mind apart from thought. Thoughts constitute the mind. Let every thought take us nearer to our “SADGURU DATTA PRABHU” every thought further our Evolution. GURU’s grace is always with the disciple, unreserved and unconditioned. It depends, however, on the self-discipline, faith and purity of the disciple whether to make use of “HIS” grace or not. “GURU” resides in the hearts of “HIS” disciples. Some are aware of this and some are not. The living presence of the “GURU” within is the best asset of the disciple. For giving this opportunity to us, thank YOU “Datta Guru”! Thank YOU “Puttuji”! Beautiful video where Swamiji in HIS divine voice giving us such a strong message so affectionately and after watching this i am sure that whenever a bad thought is creeping up in the mind this message will definitely suppress that thought. From past few months, I was on the wrong track with all the bad thoughts in the mind. I was trying to distract myself from the bad thoughts and failed all the times. Today’s Nandana MMS, gave the solution to eradicate the bad thoughts once for all. APPAJI’S picture (I am here, no fear) removed all the impurities that were in me. Music melted the harden soul, with tears. ಜಯ ಗುರು ದತ್ತ. ಪೂಜ್ಯ ಅಪ್ಪಾಜಿಯವರು ಯಾವಾಗಲೂ, ” ಸದ್ಗುರು ಸಂಗವ ಮಾಡು ” ಎಂದು ಹೇಳುತ್ತಿರುತ್ತಾರೆ. ಇದು ತುಂಬಾ ಮುಖ್ಯ, ನಮ್ಮ ಆಧ್ಯಾತ್ಮಿಕ ಹಾದಿಯಲ್ಲಿ. ನಾವೆಲ್ಲರೂ ಯಾವುದಾದರು ದುಷ್ಕರ್ಮಗಳನ್ನು ಮಾಡುತ್ತಲೇ ಇರ್ತಿವಿ. ಯಾಕೆ ಮಾಡುತ್ತಿದ್ದೀವಿ ಈ ದುಷ್ಕರ್ಮಗಳನ್ನ ಅಂತ ಒಮ್ಮೆ ಯೋಚಿಸಿದರೆ, ನಮ್ಮ ದುರಾಲೋಚನೆಯಿಂದ!!! ಎಂದು ಉತ್ತರ ಸಿಗುತ್ತದೆ. ನಮ್ಮ ಈ ದುರಾಲೋಚನೆಗಳನ್ನು ತಡೆಯಬೇಕಾದರೆ, ” ಸದ್ಗುರು” ಒಬ್ಬರ ಕೈಯಲ್ಲೇ ಸಾಧ್ಯ. ದುರಾಲೋಚನೆಗಳು ಇಲ್ಲದಿದ್ದರೆ, ಮನಸ್ಸು ನಿರ್ಮಲವಾಗಿರುತ್ತದೆ. ಆಗ ಸತ್ಕಾರ್ಯಗಳನ್ನೇ ಮಾಡುತ್ತೀವಿ. ಇದರಿಂದ, ದುರಾಲೋಚನೆಗಳು ಎಷ್ಟು ಹಾನಿಕರವೆಂದು ತಿಳಿಯುತ್ತದೆ. ಸದ್ಗುರುವಿನ ಸಂಗವ ಮಾಡಿದರೆ, ಇಂತಹ ಕೆಟ್ಟ ಯೋಚನೆಗಳನ್ನು ತಡೆಯಬಹುದು ಎಂದು ನನಗೆ ಅರ್ಥವಾಗುತ್ತದೆ. ಪೂಜ್ಯ ಸದ್ಗುರುವಿನ ಸಂಗದ ಪುಣ್ಯದಿಂದ, ನಮ್ಮೆಲ್ಲರಿಗೂ ದುರಾಲೋಚನೆಗಳು ಬರದಿರಲೆಂದು, ಪೂಜ್ಯ ಅಪ್ಪಾಜಿಯವರ ಚರಣಗಳಲ್ಲಿ ಪ್ರಾರ್ಥಿಸುತ್ತೇನೆ. ಜೈ ಗುರು ದತ್ತ ! Swamiji has said in the past ‘As you think, you become’. An energy of bad thoughts in ones mind is enough to disturb the peace of mind of the originator, and the person to whom it is aimed at is totally oblivious of such intention. Jgd. Today’s video made me realize how powerful a thought is. A silly thought can swing our mood totally upside down, especially we easily get carried away by a bad thought. It is not only just our physical actions, but also mental actions also carry the same weight. Appaji has already given us solution to control bad thoughts aka senses by chanting mantras.I will follow these instructions and keep my mind focused on good thoughts by chanting Om Namo Hanumate Namah. It is said “The less men think, the more they talk”. Sadgurudeva has given us so many tools and trained us in them. Kriya Yoga, Mantra Chant, Music to meditate, contemplate and to cultivate good thoughts. Only when the mind is still can bad thoughts be weeded out so that good thoughts can be processed. The younger generation are so lucky to have come in contact with such nobleness in their early age, compared to their peers. So, they better make use of all the time they have to cultivate good thoughts. As Appaji has cautioned “Bad thoughts are as harmful as bad actions”. Because bad actions are physical manifestations of the bad thoughts. So, Appaji wants the root cause of badness to be removed. Thank You for describing thinking process. We will follow your Instructions. It is giving more happy to see this clip, because it is good add on to become a good human. To think is to act mentally!! So profound and deep in meaning. You are right Puttuji, indeed, bad thoughts are as bad as acting bad. Thanks for this explanation. Your comments give us a brand new perspective about the message and in general too. JGD! Jaya Guru Datta!! I pray to our beloved Appaji to fill our minds with pure thoughts,so that we can be pure in our actions too…. Sri Guru Datta!! Just be realizing that 1. Sadguru is my only friend, 2. His company is the best, 3. Adhering to rules and traditions, and 4. By facing all difficulties with strength and valor would surely help us to keep bad thoughts away. In the earlier MMS, Appaji says “Cultivate noble thoughts in the mind. Express them in pleasant words. Reflect them in your actions. The way to heaven is this” Today’s MMS talks about how harmful bad thoughts are!! Whatever the reasons are for us to drift towards bad thoughts, one reminder that Sadguru is our best friend will surely make us smile and bring a peaceful and calming effect, thus helping us cultivate noble thoughts. Thank You Appaji, for these timely messages. It is very re-assuring that you are always watching over us and helping us cross these illusions! Vande Santam playing in the background, the vastness of the green pastures, the snow covered mountains and the icing being APpaji dressed in white. The serenity of white robed-Appaji is beyond explanation. I can instantly become peaceful when I see Him in white. Tranquilizer shot for tonight!! Beautiful message re-instating the 12 commandments!! JGD Puttuji. I particularly like the insight that a thought is a mental action. Thanks for this blessing. JGD. Mögen wir heute, trotzt drückender Stimmung, die Disziplin aufbringen, uns weder zu schlechten Gedanken noch Taten hinreißen zu lassen und die momentane Situation mit einem räumlich wie zeitlich größeren Abstand sehen. Die Musik ist dabei wunderbar hilfreich und stellt, zumindest bei mir, oben am Kopf alles richtig. Dank und Sieg Sri Swamiji, der uns auf solch vielfältige Art und Weise Hilfe und Meister ist. May we today, despite oppressive mood, muster the discipline to us not to get carried away to bad thoughts or deeds, and to see the current situation with a larger spatially and temporally distance. The music is wonderfully helpful and, at least for me, correct all above in the head properly. Thanks and victory to Sri Swamiji, who is for us on such various ways Help and Master. Appaji is removing Bad thoughts by educating his children through NANDANA MMS…. D Directly removing BAD thoughts in his datta children minds. Listen to Sri Appaji’s Music and bhajans, we will be in Datta Nanda Loka, hence no chance of bad thoughts. appaji has very very nicely said the inner meaning of the Sanskrit quote -Manaeva manushyaanam karanam bandha mokshayoho.. he has told it in a very simple language that even a lay man may understand what our sciptures – The Gita or the Upanishads intend to say. Sri Sri Ganapathi sachchidananda sadgurubhyo namaha. Infact i strongly feel it is appaji who has made this thought come to mind and me write it. . This is a very true saying. Thank you for creating this beautiful video with this very important message. This is a very important reminder to all since bad actions are physical manifestations of the thoughts that are bad. Thank You Sri Swamiji for this inspiring video and reminder about the nature of “bad thoughts”. I have found mantra chanting and Kriya Yoga practice to be a great help in this regard. them to Your Lotus Feet and recite the Guru Paduka Dhyana Slokam. All of these practices have assisted in changing and becoming aware of the mind. At times I have to remind myself that I am not the thoughts and this helps me to detach from them. Also just thinking of Sadguru will assist with any negativity! JGD.The smarana of Sadgurudeva is the only solution to keep off bad thoughts and deeds.Pranams to the Lotus feet of Our Appajl and Balaswamiji SGD. Thanks to Appaji for giving us so many tools which enable us to cultivate good thoughts! Sometimes theire occures situations, that I only can save my thoughts with the Gurumantra, for not thinking bad thoughts. Sometimes I still fail. I`m so sorry for that! I do hope, beloved Sadgurudeva, that with YOUR inspiring words and Your blessings I can overcome my weakness! Thank You so much for all this wonderful and indescribable important MMS ! S.G.D.! Hmmmm, so easier said than done! But, with determination and conviction toward the good (GOD), with Kriya yoga, definitely chanting to increase higher vibrations to weed out the lower vibrations of bad thoughts, hatha yoga to calm the body and mind of stress ( stress is a leading cause of irratic and bad actions, I think. When one is too stressed, his total makeup is stressed, spiritual also). It makes sense that the root of an action is of course the thought before… It is very difficult to root out a bad thought. Just as we have to pull up the entire weed in the garden less the weed will definitely come back! Some weeds are very stubborn!How to do? Is this mantra Om Namaha KalapurusayaNamaha(what does this mean?) helpful in weeding out? What is the proper tool to dig it out, Swamiji? Chanting incessantly keeps the mind clear, yes. But, I noticed too that there are several faculties of this mind. The mind can think of several things while chanting too! 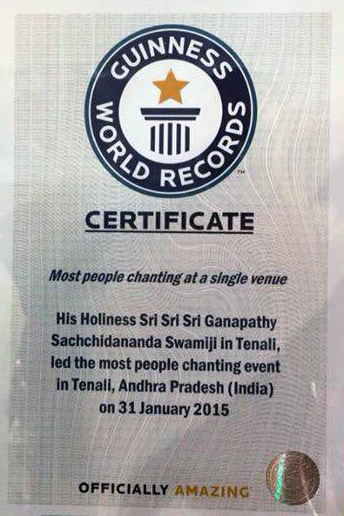 It’s pretty amazing…And how much can one chant in this life? I guess if we fill our minds with only good there will be no room for the bad thoughts. Just as with the sunlit room, there is no darkness…. A bad thought is an indicator that there is some darkness within us that we need to WEED out! We must attend to it….And not let it grow…The weeds stem from the innermost enemies of man. When we have a bad thought , we must realize that we have to address one of these enemies headon with Japa, prayer, yoga,etc. and a sincere determination towards the good… We cannot just ask Guru to do the weeding. We need to act in our own internal wars.. He is only there to guide us and give us strength…Swamiji,Please help us all weed out the most stubborn weed and let us move into the realm of unconditional love once and for all! Thanks for this forum. JGD! But of course! Namasankirtana is the special arrow! Within the half hour or so of posting my thoughts, I started exhuberantly SINGING Jaya Lambhodhara pahimam! In that instant was my answer…Namasankirtana for as Swamiji says, namasankirtana is the quickest way to the kingdom of God! JGD! Jaya Guru Datta Appaji !!!! Thanks for the Valuable Message !!!!! OM NAMO HANUMATE NAMAH !! Sree Guru Datta !!!!! and the explanation part in Puttu Gam. Bad thoughts are a magnet to bad actions, that occur to oneself then. The opposite is also the case. not to speak of the results that are still more auspicious! Ps: I`m glad, that every bad thing has an opposite to focus on … this brings hope. And after all, a general focus on the bright side of life – in advance – is the best precaution. My grandmother always said : “Bad humans don`t have songs”, and then she began chanting. Thank you puttuji.. I can only appreciate and bow down to the analysis given. An action is attributed to a thought that would have taken precedence before the action. This message from Pujya Appaji is a message to the perceived bad actions/results that we are seeing in the civilized society. By being aware of the thought, may be we can prevent a bad action. Any change has to start at an individual level. Thankful to Parama Pujya Sri Swamiji, who has given us the mechanisms and multiple tools to control and stem these bad actions and convert into a good thought/action. A lesson to the present agitated generation to keep their heads cool (like the icy mountain shown in the video.. Thanks to Parama Pujya Appaji for this beautiful capsule. JGD Appaji! Please bless me with being able to first of all reduce the amount of my thoughts in general and secondly to purify my mind so that bad thoughts – both consciously or seemingly from nowhere – are diminished. Please forgive me for any bad thoughts which have cropped up in me towards You, my Lord! Sri Guru Datta! జయ గురు దత్త ! అప్పాజీ ! చాల చాల సంతోషం . Jaya Guru Datta – Bad thoughts are rather more harmful than the bad actions. the thoughts trigger the action as Puttuji has detailed in His comment – however, the suppressed thoughts become more dangerous due to the suppression and become harmful to the society. Hence, Appaji is advising all of us not to think bad, neither act bad. This means that we have to cultivate righteous thinking which is the genesis of righteous actions. Thank You Appaji for a wonderful message and prayers at Your Lotus Feet for granting us the needed buddhi to be righteous. Jai Guru Datta, Appaji. Every bad action is preceded by a bad thought. As Krishna stole butter from Gopikas, You are stealing all the dirt of our minds….even without our knowledge….even as You play with us, as You have us (seemingly) do seva, and as we travel with You in this journey. Chitta Suddhi Pradayaka, Sadguru Deva, Namo Namaha. Sri Guru Datta. Absolutely true……. May lord bless us all to have good thoughts and always act accordingly, so that we are always in righteous path.